Please note that these pages are far from finished and the information contained will change several times a week as more is uncovered. Keep the refresh on a constant and return often as it's not possible to give personal notifications of changes. This also applies to the links listed above. During the time period of early 1968 till fall of 1970 David Byron did a lot of session work at City of London Studios and PYE Studios for Avenue Records singing vocals to earn extra money. In addition to singing lead vocals; he also recorded a lot of duets and tracks with only backing vocals as well. These recordings are cover versions of Top 20 hits and were released on numerous EP's and LP's. Since no official CD has ever been released dedicated to David's work, these songs became extremely rare. With no official credits listed on the original recordings, information on them was only speculation and due to lack of verification it became extremely difficult to put together an accurate track listing by artist without mistakes or errors. Originally the thought was David couldn't have recorded more than several dozen tracks but now it’s been confirmed that the total would be over one hundred forty or more. With the time concerns placed on him during that period, this would have been a remarkable schedule to maintain. A month or so before Uriah Heep went into the studio to record "Salisbury" in October, 1970 that appears to mark the end of David's work with Avenue. The combination of touring, rehearsing and recording sessions planned; the pressure ultimately forced him stop participating. These type albums were referred to as "budget albums" because they supplied the same songs as the original releases but at a fraction of the cost. Avenue Records were small in comparison to the other labels doing cover recordings such as PYE, Flair, Marble Arch, Deacon, Fontana, MFP, Reddifusion or Hallmark. In the US these type albums were done as well by labels such as K-tel. With a much smaller distribution system and a limited market Avenue recordings are rare in normal outlets. As time has pressed on the Avenue label is considered the "gold standard" for this segment of the music industry. The vocal tracks were so well regarded that some were leased out to other labels and used on other budget album releases with different music by other musicians. David's voice is known to be on other releases but it's just not possible for this site to give you that information at this time. Due to the quality of the recordings and the talent pool possessed these tracks keep surfacing in many forms with many false claims attached. One major example are the tracks shared by David Bowie fans claiming his voice is found on these releases, that isn't true. The voice mistaken by those fans would belong to Tony Steven, who was used only in short term according the official sources. So if you happen across any of these recordings be forewarned that just because it's an Avenue Records production, that doesn't mean every track or any track for that matter is David Byron's voice. With several different versions of songs released even knowing the name of a track to look for can be difficult since there is no list of what release it may have appeared on. Multiple tracks by Peter Lee Stirling and Danny Street can sound like him in places so this makes it difficult to trace down every single song, even for the most avid of fans. Since it's still not known the final total of material David did, this page and all the information that will follow soon are for the soul purpose to document the truth of this chapter in David Byron's life and career. It appears to have played a major role in that period as well. The main goal here is to end the long list of mistakes posted on the Internet and correct the false information that has circulated for years. Eventually a link will be added to a list of over 140 songs David did sing on but it would still be a difficult task to find every particular track. If you purchased an EP, a Chartbusters album or a 12 Top Hits LP containing the same title from a used record store, at a record show or off of eBay; any place these used records are sold, the chances are you may end up with a different version with a different vocalist. This is one of the major reasons these recordings are so hard to trace down all the information on; to gather all that is available and why it isn't possible to list the vocalist by track in the listings for the records released and documented in the links above. Multiple versions were recorded of many of the Avenue tracks and sometimes included as many as five different lead vocalists. These tracks were released on various vinyl records under titles such as Top Six, Top Six From England, 12 Top Hits, England’s Top 12 Hits, Chartbusters, Studio 33; and compilations such as Groovin’, The Rock Star Parade, Super Soul Sounds and multiple other titles. David participated on multiple releases under these names but its apparent some of the releases listed false artist names but not the actual participants. David sang under listings such as Dave’s Soul Group, The Beat Kings and the rehashed name John Smith and The New Sound. Multiple other names are known and they overlap by other artists as well but again this can't be listed with accurate results. Other unknown singers and musicians took part in these sessions that later found fame themselves. Reginald Dwight [later known as Elton John] recorded dozens of tracks with Avenue as well. 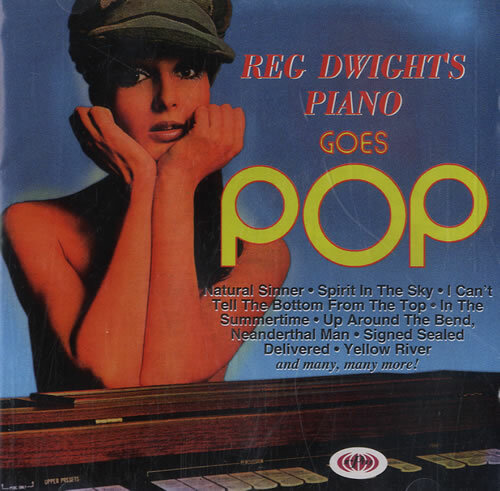 Three tracks that were duets with David; "It’s All In The Game", "Up Around The Bend" and "Come And Get It" were included on a CD compilation titled "Reg Dwight's Piano Goes Pop" featuring Elton tracks from these sessions. No mention of David Byron's voice is ever noted even though these songs have been released on at least three different titles to date. David did as many as five or more duets with Elton during this period and different versions of several of those songs were recorded. These tracks featured each backing the other in chorus and these would have been recorded on the same date. Elton also recorded many of the same songs David did as well and it's interesting to hear both versions to compare the styles of each artist. Peter Lee Stirling [Born Peter Charles Green and recorded under the name of Daniel Boone throughout his career], Dana Gillespie [a popular award winning blues diva with over 50 albums to her credit], Danny Street [one of the most popular studio singers of any era who made a lifelong living with the BBC], Tony Steven [noted BBC session vocalist], Martin Jay, Laura Lee and Ken Barrie [musician and actor best known for narrating the BBC television program Postman Pat] are a few other vocalist to take part. Further information on vocalist will be added as we find the truth and quotes from those we contact over time. Avenue Records were founded in the mid 1960s by Gordon Melville who was listed for Production Credits under the name Mel Gordon. The first Avenue Records six track EP cover version record was released on May 1, 1967 and Avenues last LP was AVE 0141. It was released in early 1974 and there were no more beyond that date in the U.K. Avenue's office and warehouse in Harlow Essex was taken over by The Fifth Avenue Recording Company Ltd. and Artistry Recordings in 1976-1979. The name was changed to CRC Recording Company in 1980 and then to RST Ltd. Colin Richardson became head of A & R for Fifth Avenue in 1978; he has moved with the recordings throughout changes from Fifth Avenue, Artistry and Phoenix. At present he has all legal rights to exploit the defunct Avenue catalog. Most of the music was under the direction of a brilliant musical talent named Alan Caddy [pictured left], former guitarist with instrumentalist group The Tornadoes. Most album and EP listings included the music as The Clive Allan Orchestra and Singers or The Alan Caddy Orchestra and Singers [both of these names were Alan Caddy]. With multiple top 40 hits in the UK and several in the US in the early 60s he forged his way into respect of the industry. After leaving Avenue in 1974 he ended up relocating to Canada. He worked as music director and arranger for Polydor Records before moving on to the Fontana Record label. Sadly he died in August of 2000 so his story ends there. 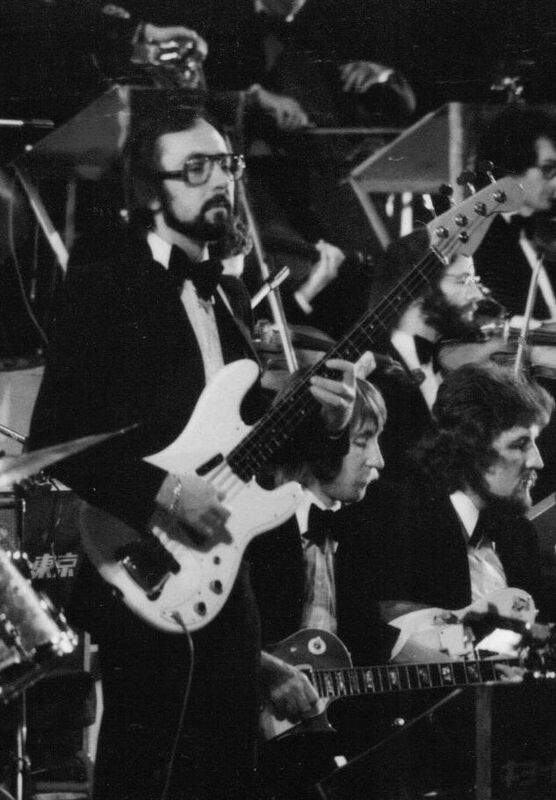 The main bass player was John Fiddy [pictured right]; best know for his arrangements over the years with band and orchestra settings. He wrote and arranged the orchestration for Uriah Heep's "Salisbury" in 1970. Tony Stevens sat in doing bass work on certain sessions [he preferred to be called Tone those days and was the bass player for Savoy Brown plus a founding member of Foghat]. We are trying to find out other musicians who took part in these sessions at this time to add to the story. Other members of Uriah Heep also took part for a brief period of time with the backing music. Mick Box played guitar on some tracks and bassist Paul Newton also participated briefly. It had been rumored that when starting out in 1968 and still known as Spice the entire band went into the studio together to record for Avenue when the sessions were confined to City Of London studios. This is now confirmed as Nigel Pegrum made note of this in comments during interviews. Official comments and statements will be added in time to reference all this information. These recordings can't be dismissed for the historical content contained. The biggest example would be the thought that David Byron's first charting album would have been with Uriah Heep; this is far from the truth. The April 1969 Marble Arch release "Spring Chartbusters" would be the first. While featuring Avenue recordings it contained at least two tracks from David and charted for one week on May 3, 1969 where it stood at the # 15 position on the British Charts. One other Marble Arch release of Avenue material topped that mark in 1970 when the release "Chartbusters '70" entered the charts on January 31, 1970. It remained on the charts for five weeks and reached a peek of # 7. This LP featured as many as eight songs with David singing lead vocals. One thing David offered to Avenue Records was a unique multi-talented voice that offered extended range and verity. His covers included most of the standard popular acts of the time such as The Beatles, The Rolling Stones, The Who, The Hollies, Marmalade, Herman’s Hermits, Creedence Clearwater Revival, The Monkees, The Doors and many others. David's verity in taste ventured into many other styles and genres such as covers of work by Mo-town artists as well. In all the research one thing is relevant; during the first few EP releases David was on, maybe one song would be featured with his voice. As time progressed he ended up dominating some of the recordings with his tracks. But the process also had the same effect on his ending work with the label as he was only on one song in the end. I never wished it to end, even now........... The search for the truth has taken a major swing in the right direction however. We only share what information we are comfortable with and if anyone has further input to consider; please contact me here. Artistry Records has confirmed to own the master tapes of all the Avenue sessions. Most importantly they also possess the information required and maybe, just maybe the mystery will finally have a final closing with the results the fans want; to know beyond doubt that the track is actually David singing and hear this in crystal clear re-mastered format. At present one 20 song CD has been mixed and the glass master is ready to be pressed of re-mastered tracks. A second disc is planned after that one and if those are successful more will follow. This is a virtual goldmine for the fans of one of the greatest voices in rock music history; the voice of our past, the voice that stalks the soundtrack of our life. The voice we want to hear one last time do something different we have not heard before. So this page is dedicated to the hope that everyone will get to hear it soon or maybe this will not be the end of the story, but only the beginning of another chapter. Let's hope that is the case and please if this happens give it your full support to the one voice who can no longer give us a smile except from the past. It's our past too. Please click the page linked below and like this page on Facebook. 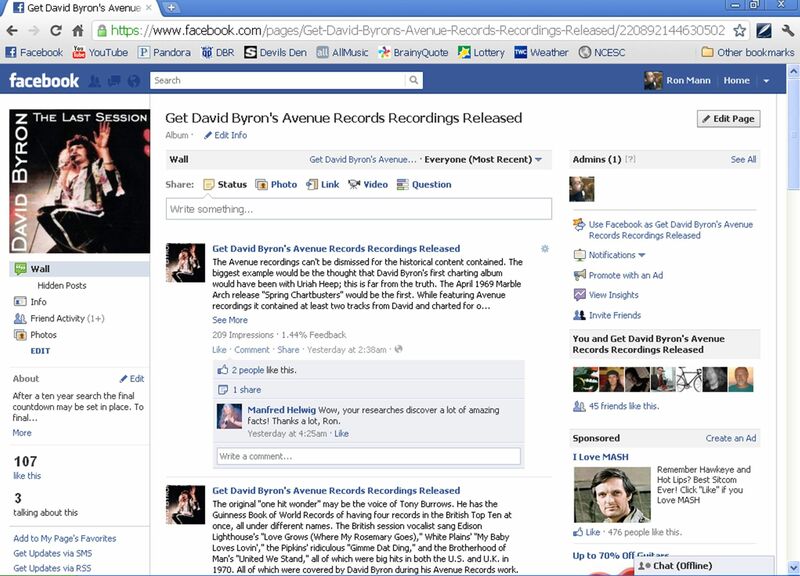 "Get David Byron's Avenue Records Recordings Released". Tapio Minkkinen and especially to Colin Richardson for being the one to make this happen. information purposes only and without any intent to sale or profit from the copyrighted material listed.